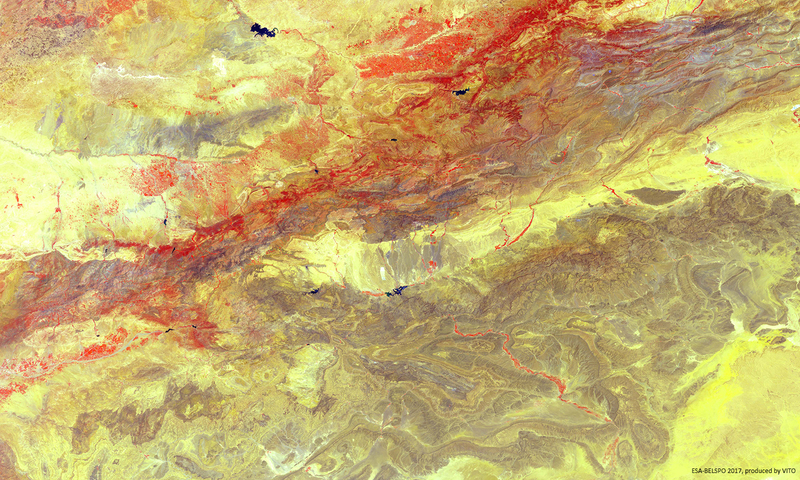 The High Atlas mountain range (bright red in this mid July image) in Morocco stretches from the coast of the Atlantic in the west to a plateau on the border with Algeria. Jbel Toubkal is the highest point (4167 m) and is visible from the Ochre City (Marrakesh), the fourth largest city in the country. In darker tones, the Anti-Atlas mountains are shown, nicely bissected by the Draa River valey (reddish line), flowing southward from Ouarzazate city and leading into the Sahara desert. The famous motion picture Lawrence of Arabia was largely filmed in this city in the 1960s. This berber heartland is a landscape of extremes, with clear basins (dark blue) and running water among vast dry and barren land with rocky outcrops. By contrast, the higher and less steap northern parts of the High Atlas are commonly used for winter sports.